No trees were harmed in the making of these blocks. No, no, that wasn't it. I am, by no possible scope of the definition, a woodworker. And, I'm not so sure this was such a great project for an almost 6 mos pregnant lady like myself - too many contortions required by my less-than-mobile body! Now that that's out of the way... I'd seen some cool, natural wood blocks in a catalog awhile back and loved them, but thought they were a little pricey. 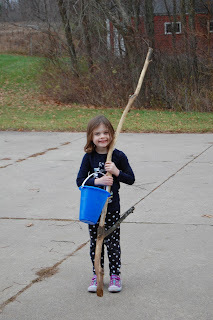 Then, my friend had a black walnut tree taken down on her property and said she had some fairly good-sized branches left and my mind started ticking. So, I decided to make these to enter into an auction for our local chapter of Wild Ones, a native plant organization that I am involved with. There are several other blogs that talk about how to make blocks like these, including "Life on Willowdale" and "Home in the Country". They both left the bark on, but for these I decided to try to remove the bark partly because it was fairly covered with lichens and also because of the nature of black walnut wood - it has really cool striations of the darker heartwood and lighter sapwood that I hoped would show better with the bark off. (And, let's face it, because I like to make things harder on myself than necessary.) There is also a Google Doc from the State of Minnesota DNR and Project Learning Tree that has some useful information in it. 1. Collect the wood. We started with several branches, each about 6' long and ranging from about 2 1/2" at the base to 1" thick at the tip. 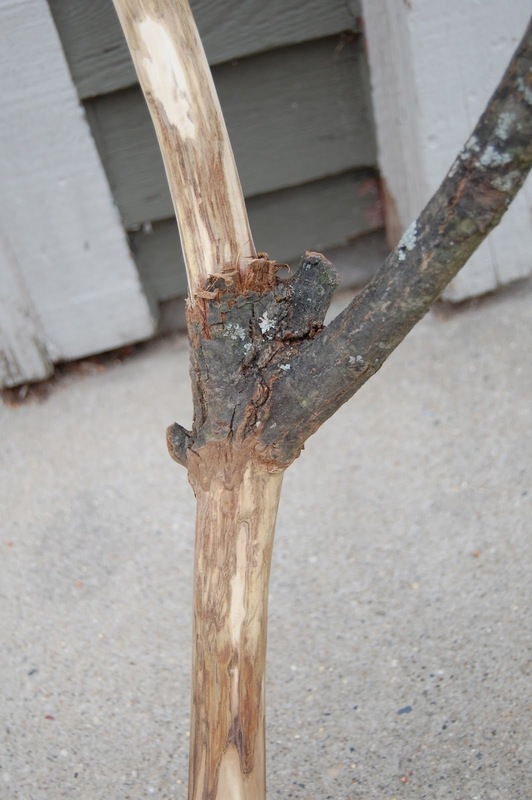 Branch with bark (mostly) stripped. 3. Cut the branch into your blocks. Try to vary the cuts so that you get a variety of different lengths and widths for your blocks. I used a compound mitre saw, but you could definitely use a hand saw. Sand the cut edges so that no rough spots remain. I used a coarse and then a fine sandpaper. 4. Dry the blocks in an oven set at a very low temperature (200 degrees or lower) for a period of 2 to 5 hours. To do this, place a wire cooling rack on top of a metal cookie sheet, then add a piece of parchment paper to the top. Put the blocks on this set-up and periodically rotate the blocks. Because I'm a geek, I also weighed a couple of the blocks every half-hour - they lost about 10% of their mass by about the 2 1/2 hour point and then stayed pretty consistent for the next hour so I turned off the oven then. It will be interesting to see if they crack over time, though. 5. Re-sand the blocks, if necessary. I noticed that the drying out process seemed to roughen my edges a bit so I did a quick sanding job. 6. Coat with a protective layer. I used a jojoba oil/beeswax mixture that I bought a while ago from Jupiter's Child on Etsy. (I also bought an adorable carved wooden squirrel for our nature table - they have some really cute things!) I think you can make your own using olive oil and beeswax (or jojoba oil, which smells amazing, if you can find it). Rub the wax/oil mixture onto all the surfaces of the block. (An aside: Rub the mixture into your hands. Ah!) Let sit for at least an hour then buff off with a smooth cloth. Blocks coated with the oil/beeswax mixture. 7. Play with your Natural Wood Building Blocks! While I like the look without the bark, bark removal is not an easy process and added at least a couple of hours to the process, between de-barking and sanding. If you do decided to remove the bark, realize that some types of trees are much easier than others to remove their bark. Also, I've heard that it is easier to remove bark in the spring when the sap is running. Obviously, the sawing part of this process is not appropriate for young children. I used a small hand sander for most of my sanding (a Dremel would probably have worked even better! Can we say Christmas List?) but if you do the sanding by hand then kids could help there. They also would be great coating the small pieces with the wax/oil mixture. Sydney helped me carry stuff out to the barn but, luckily, she is terrified rather than intrigued by the loud saw I used, so she vacated shortly thereafter. Air-drying is really probably the way to go, but it requires a lot of patience. My understanding is that it takes about 1 year/1 inch of thickness of wood, depending on the warmth and humidity levels of where you store the wood. I have several branches left that I'm going to treat with Anchorseal, a waxy product that I picked up at our local WoodCraft store, and try to make another set of blocks next fall. If you end up doing this project, please let me know how it turns out and, as always, if you have any ways to improve it! (As I said, I'm not a woodworker!) 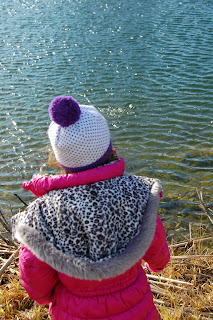 You can also add any pictures to a new Flickr group I just created, Activities with Momma Owl's Lab. This activity is another use of your Halloween candy stash. It is adapted from an activity on CandyExperiments.com - which is a very fun site you should definitely check out for more ideas of what to do with your leftover candy. Many types of candy has an acid as one of its major ingredients (the origin of the sour flavor) and it will react with baking soda to form bubbles of carbon dioxide. Since we've been talking lately at the dinner table about the importance of chewing your food rather than swallowing it whole, this activity also looks at the impact of surface area on the reaction that is created. Start off by showing your child the Smarties candy and telling them that you are going to add the candy to some different liquids to see what happens to it. Give your child two Smarties (preferably the same color) and have them drop the Smarties into the cups at the same time. We did a count-down and its not really that important that they go at the exact same time, just as long as its pretty close. If you are using a science journal or something similar, have them record their observations in it before moving on. Discard the solution and rinse out the cups because they are going to be used again in the next step. Now that you've established that Smarties react with a baking soda solution to form bubbles of carbon dioxide, we are going to experiment with how the size of the Smarties affects the reaction. Again, add about 1/2 cup of water to each of the cups. Then, add 1 teaspoon of baking soda to each of the cups and have them stir it in. Let the solution settle for a bit so that it clears up. For this part of the experiment, each child needs 4 Smarties. Put two of the Smarties aside and then take the other two and place them in a sandwich-size plastic baggie. (Make sure the top is well secured!) Let them pound the candies into very small pieces. At this point, pause and ask your child to predict which type of Smarties, the smashed one or the whole one, they think will make more bubbles when it is added to the baking soda water. You are going to add the Smarties to the two cups of baking soda water simultaneously, or as close as you can get it. We found that it was a little tough to get the Smarties powder out of the plastic bag as it kept getting stuck in the zipper at the top. Instead, we snipped a hole in one of the bottom corners and I poured it out of the hole into one of the cups while the girls dropped the whole Smarties into the other cup. Observe the reactions that occur in the two cups. They should be able to see a great deal more bubbles in the cup with the smashed up Smarties. Again, lift up the cup to their ear and have them listen to the difference in the bubbles - I think its much more extreme than just looking at it. Revisit their prediction about whether the whole or smashed up Smarties would make the greater number of bubbles. If you are using some sort of science journal, give them time to record their thoughts and observations. Sydney's journal is pictured to the right and, as you can see, its a combination of her drawing and both of our lettering. I try to have her write a summary sentence after each activity (which you can kind of see at the bottom) but I help her with some of the other writing. 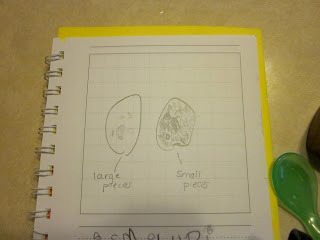 Also, as a note, I didn't think Maya, who is 3, was getting anything out of the journal process, but she opened to the graph that we did last week and she said, "Look, Momma, that's from our M&Ms", so maybe she is getting more out of it than I thought! Smarties candy contains an acid known as citric acid (the same one that is in citrus fruits) that is responsible for its sour taste. Citric acid will react with the baking soda (sodium bicarbonate) solution to form bubbles of carbon dioxide. Sodium bicarbonate is actually a weak base and it breaks apart in water; it is then free to react with the citric acid and forms not only carbon dioxide but also sodium citrate and water, although these aren't as readily apparent in our experiment. This activity also examines the affect of surface area on the rate of a chemical reaction. As predicted by my girls, the smaller pieces/greater surface area had a much faster reaction rate/greater bubbles than the whole pieces of Smarties. I tied this idea into why its important to chew your food when you eat rather than just swallowing it whole. When you chew your food well, then the smaller pieces make it easier for your stomach to break it down the rest of the way so that you can get energy out of the food. You could use this basic technique as an acid test and drop a variety of candy types into the baking soda solution to determine whether or not they have acid in them. A great way to use up a huge quantity of candy in a short amount of time! Another thing you could do is use it to experiment with other things that might affect the reaction rate, i.e. temperature or quantity of solution. Fill one cup with hot water and one cup with cold water and drop a whole Smarties candy into each one and see if you can discern any difference in the reaction rates. 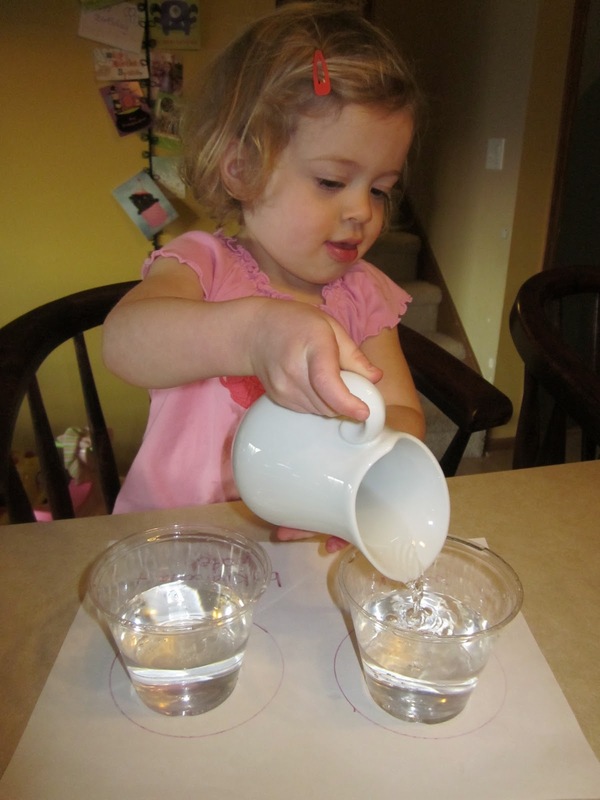 Or, fill one cup with a tiny amount of solution and fill the other to the brim and make the same observations. 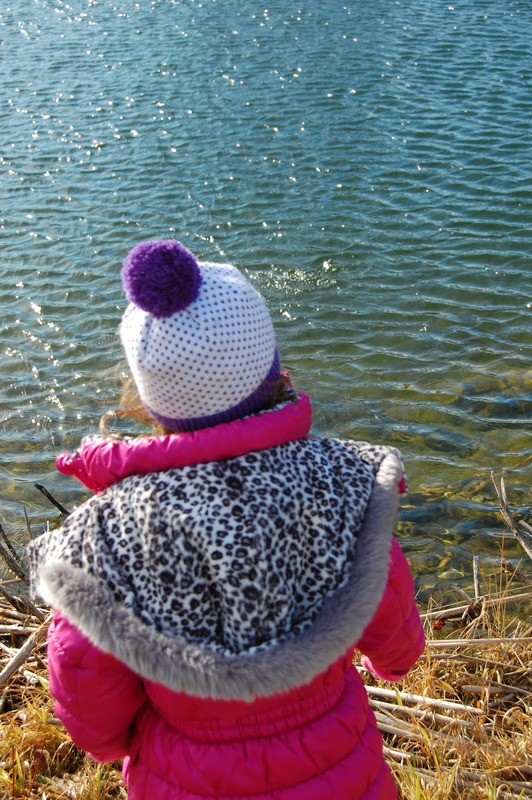 For older kids, the reaction of sodium chloride and water is actually an endothermic reaction, meaning that it absorbs energy from its surroundings thereby making the solution itself cooler. Use a thermometer to see if you can measure the decrease in temperature that occurs when you mix the two substances together. You may need to use an insulated cup and play a bit with quantities to get a discernible difference (depending on the sensitivity of your thermometer) but, hey, that's part of the fun! The process was pretty easy. Unwrap your candy and dump it in a bowl. Provide toothpicks to help stick the pieces together and let them make whatever creature they can come up with. Of course, they wanted to eat it, but my compromise was that they got to pick one that they could share after dinner. The rest went in the trash. This may become a new Halloween tradition - I'm just not going to let the candy taunt me for a week before we break out the Candy Creature activity again. Post-Halloween Day 3? I was a little under the weather on Halloween (even my costume couldn't buoy me up...ha!) so we had a limited trick-or-treating experience. Luckily, we still came home with enough M&Ms to do this fun activity. 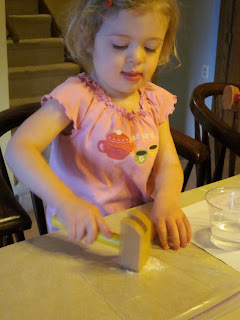 This activity introduces the idea of graphing to your child, in a fun and edible way! While it is more of a math activity, the concept of graphs (what they are, what they show, etc.) are extremely important in all aspects of science. There are many, many ways to extend this activity for older kids which I'll discuss at the end. Note that you really could use a variety of candy here, from skittles to large packages of jolly ranchers. 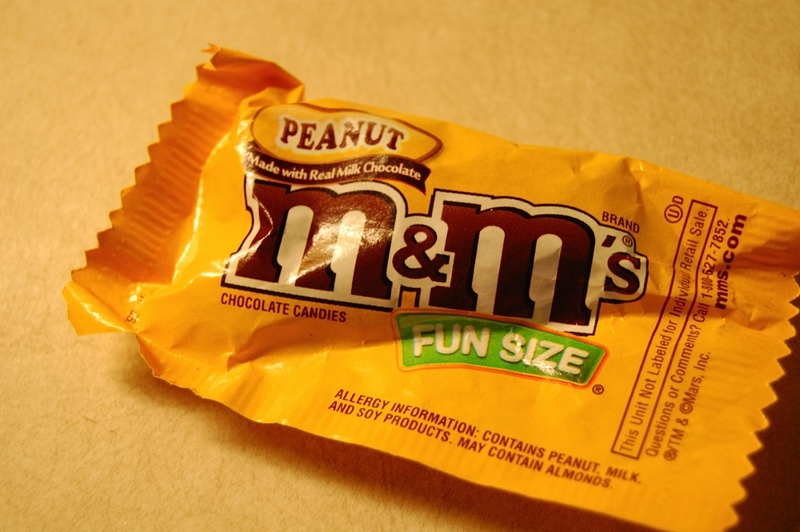 It's best to have at least 15 pieces of candy in your sample, which is just about what is in the milk chocolate M&Ms "Fun Size" bags. We also did the experiment with Peanut M&Ms, but there were only 7-8 pieces in those bags which is a bit small of a sample. Start out by asking your child if they know the colors that M&Ms come in (red, orange, yellow, green, blue and brown). Show them the package of M&Ms and ask them to predict which color will have the most. Remind them that they can't eat the candy until the end of the activity - probably the hardest part for them! Open the bag and empty it onto the table. 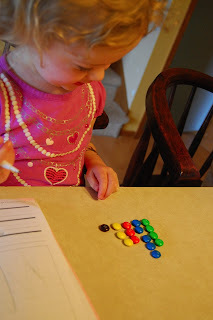 Ask your child to sort the M&Ms by color and then place them into lines that are next to each other. Have them count the number of M&Ms in each of the color lines. Ask which color has the most and which color has the least. You can ask them if any of the colors are missing and talk about the idea of zero, if they are ready for that. Another thing you can do is have them count the total number of M&Ms that they had in their package. If you are doing this with more than 1 child, you can have them compare to each other. And, hey, if not, I think that means mom or dad or grandpa or auntie or whoever is doing the activity gets free license to have their own package of M&Ms. For purpose of scientific advancement, of course! Once you are done with counting and discussing the M&Ms, then show the child how to make a graph of their results by coloring in one box for each M&M in the appropriate color. So, if they have four green M&Ms, then they should have four green boxes. My five year old was able to do this on her own, but I helped my three year old by outlining the appropriate rectangle size on the graph paper when she told me how many M&Ms there were and then had her color inside the rectangle that I had drawn. Once they are done with each of the colors, you can go back through and ask the same questions you did earlier, but this time have them use the graphs they have made to answer the questions. Graphs are extremely important in science as a way to communicate results in a visual and often clearer manner than using just words. You can explain a graph as a picture that shows the results of an experiment. 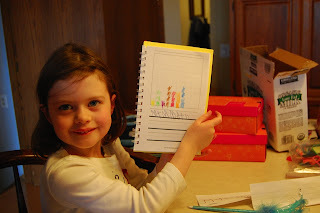 There are many different types of graphs, from the bar graph that we did in this activity to the common pie and line graphs to less common graphs such as radial graphs. Once you have introduced the concept to your child, keep an eye out for graphs that you may come across in your day-to-day activities (i.e. in the newspaper or on an advertisement) that you can point out to them. 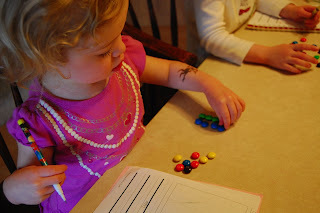 For older kids, there is a huge amount of math that can be done with M&Ms, including averages, percentages, mean, medium, mode, etc and there are lesson plans out there for every age from elementary school to AP Statistics. There is a good activity at Science Buddies that provides some step-by-step instructions, a data table and some good links to other sites that can assist with some of the math concepts. And, you could incorporate the use of a spreadsheet program like Excel. The other important science concept that could be discussed with older kids is the idea of sample size and how that affects the results of an experiment. One small bag of M&Ms is a very, very small sample when compared to the total population of M&Ms. If you are interested, I found this pdf from Oregon State that has the percentages of M&M colors apparently from the Mars website - although it must be an older page because the direct link to it is no longer active. Just don't let them talk you into buying a case (or more!) of M&Ms in order to have a larger sample size so they can better test their hypothesis!